Gondra Oraon is 45 years and belongs to the Oraon tribe. He lives with his wife and 5 children – 2 boys and 3 girls. 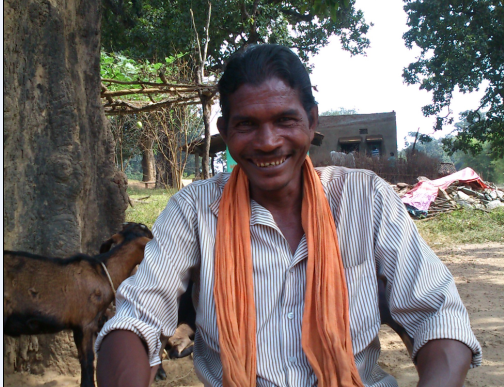 He lives in Girija tola of Luchabahal village, Kuarmunda Block, Sundargarh. Agriculture was not the mainstay of tribal communities. They mostly depended on forest and forest products for their food and livelihoods. Gondra started cultivation after his marriage. The first year he cultivated crops using chemicals. He was able to get good yield and sell his produce in the market at good prices. However, from the second year, he incurred more costs on use of more chemical fertilizers and pesticides. His yields were not as per expectations and his net profit reduced. Due to the excess use of chemicals like Endosulfan, his health was adversely affected and had to be hospitalized. He incurred huge expenses on his medical treatment. The nails on both his legs were affected and did not grow normally. He also had other respiratory disorders due to inhaling of chemicals sprayed on his crops. His other family members were also adversely affected due to the storage of chemicals and consumption of vegetables sprayed with chemicals. Some of is his family members also had to be hospitalized. This entailed increased family expenditure on medical treatment. Thereafter, Gondra came in contact with DISHA and was introduced to organic agriculture and sustainable farming practices. 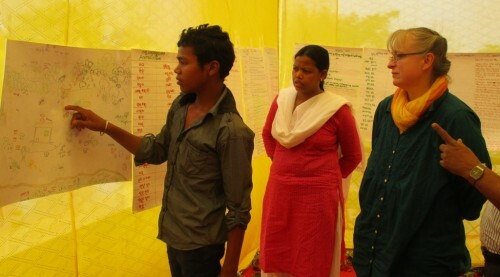 He was motivated and inspired to practice organic farming on his farmland. He now practices organic farming in most of his farmland though he cultivates a small proportion of land being cultivated using chemicals. He cultivates crops using chemicals for commercial purposes based on market demands. For his family consumption, he consumes the crops grown organically. Gondra has adopted mixed cultivation, intercropping and crop rotation practices useful in protection soil and controlling insects and pest attacks. Gondra produces farmyard manure through compositing and also produces vermicompost. He uses these organic manures on his farmlands. The water holding capacity of the soil has improved. This also helps in controlling weeds and limits the excess use of water for irrigation. He produces organic pesticides using fish tonic, cow dung urine, ash and sprays it mixing with Surf. This is a local innovation as the surf binds the ash and other organic pesticides and remains on the crop leaves and wards away pests and is effective in controlling crop diseases. This ensures better taste and improves the soil health. He has now realized the ill-effects of chemicals on crops, health and the environment. He is now convinced that organic farming is the key to sustainable agriculture, protection of soil, water and environment and for a healthy living. Gondra cultivates vegetables throughout the year with little use of water. He grows crops like traditional varieties of paddy, black gram, til, green gram, arhar, brinjal, potato, raddish, carrot, bhendi, bottle gourd, pumpkin, greens, onion, tomato, etc. Gondra has also planted fruit crops, horticultural and multi-purpose tree species which contribute towards better soil health and provides fruits, fodder, firewood and food throughout the year. He has planted trees like Drum stick, Jack fruit, Lemon, Tamarind, Subabul, etc. He gets additional income from these trees. Gondra has adopted an integrated farming systems approach. This has contributed towards better utilization of land and increased yields. 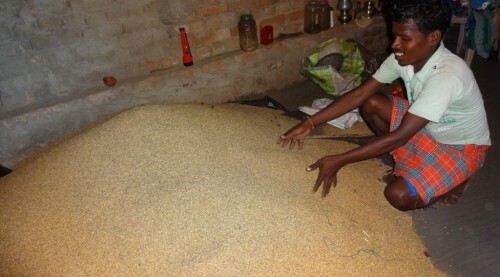 Gondra has taken crop loans from nationalized banks and has purchased agri-inputs (seeds, manure, etc. ), farm machinery, like power tillers and has availed crop insurance and personal insurance. He has now understood the sustainable organic farming model and is convinced that he can make a decent living using his newly acquired knowledge and skills on organic farming. Gondra has been part of the campaign to ban Endosulphan. He is now a successful organic farmer and advocates organic farming in his Oraon community in the nearby villages.